Posted by jeremyliew in business models, digital goods, games, games 2.0, gaming, mmorpg, virtual goods. … here is the rack of game cards available at Target — snapped this weekend, and strongly reminiscent, finally, of similar shots I have taken in Korea, Japan, and China. For years, there was no such rack in the US. Then it was just a couple of cards, and only at some checkouts. Now it gets a rack right between the TV box sets and the top pop albums (you can see REM’s latest CD there, abandoned on the top shelf). Besides the cards you maybe expect to see, like Club Penguin, WoW, and Zwinky, there’s also a large stack of ‘em for gPotato games (Flyff, Shot Online, etc) And Acclaim, which make their living by bringing over games from Korea. There’s WildTangent cards, and the Gaia cards are almost sold out. The diversity is interesting, as is the lack of cards for most of the core gamer MMORPGs. The strong presence of the often-marginalized Korean games is telling. One of the challenges in monetizing MMOGs through virtual goods in the US has always been finding a way to sell them to young players who don’t have credit cards. Gaia even employs 3 people whose sole job it is to open snail mail envelopes full of cash that people send in for virtual goods. 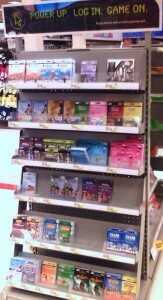 Pre paid cards at retail are an excellent way to monetize this audience. I have heard from a number of MMOG companies that they have seen a substantial increase in both ARPU and velocity of spending since releasing these cards. Watch this space.